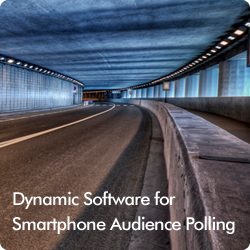 Service Levels - Smartphone Audience Polling, Voting, and Q&A. Please complete the form below and one of our PushOne™ staff members will contact you shortly to schedule your free demo. We offer a variety of service levels to fit your exact need. Whether you are interested in using PushOne for a single event or on a daily basis in a classroom setting, we can match you with a service level to fit your need. The service levels include full service with on-site technician, hybrid meeting (Smartphones/iPads and keypads combined in a meeting), Poller 2.0 (self-service multiple choice polling), and subscription service (subscription to or Poller 2.0 for single-digit polling or ARS Pro software for conducting multiple choice polls, "free response" polls, and Q&A ses-sions with eQ&A). PushOne can be used in a variety of settings including classroom teaching, corporate meetings/events, strategic thinking, employee training, elections, association meetings, and more. Contact us today for a proposal for your next meeting/event or for more information and pricing on a subscription to PushOne ARS Pro.